A Slice of Smith Life: 7 Quick Takes: 7 Simple Ways to Celebrate Saint Nicholas' Feast Day! 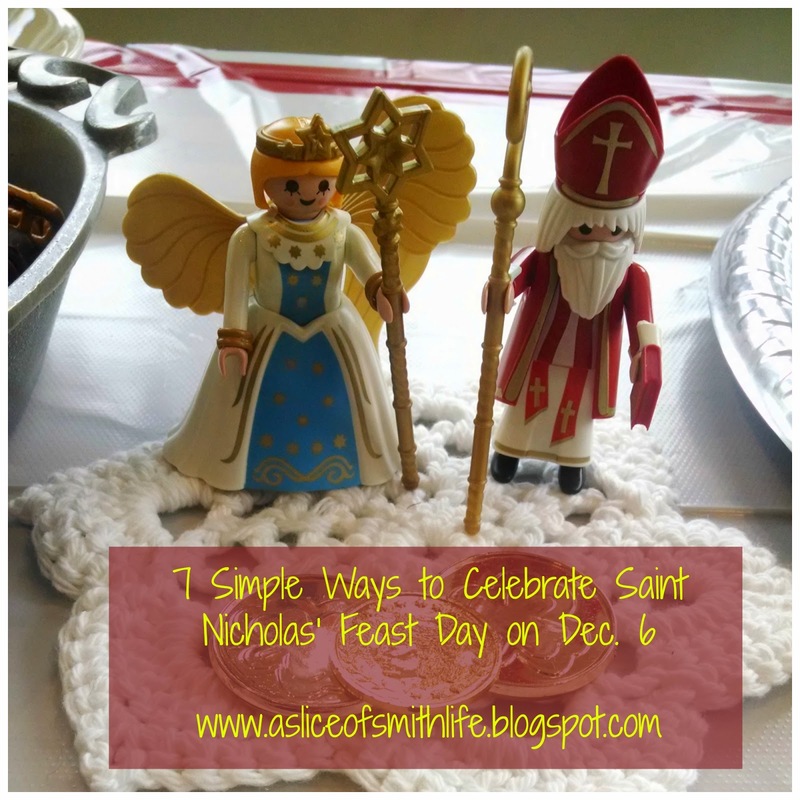 7 Quick Takes: 7 Simple Ways to Celebrate Saint Nicholas' Feast Day! So Advent has begun and we are enjoying our Advent traditions that I have gradually added over many, many years. There are some fun feast days during Advent that our family enjoys celebrating! One of these feast days is December 6, the Feast Day of Saint Nicholas. Here are 7 simple ways to celebrate Saint Nicholas, a Saint with a generous and giving spirit! Watch a DVD. This is one of our family's favorite that my children watch all year! Set out your shoes by the fireplace/door on the evening of December 5th and see what goodies are in your shoes the next morning on Saint Nicholas' feast day. It is a tradition in many households to set out your shoes so that "St. Nicholas" will leave small treats in the shoes to represent how St. Nicholas long ago showed God's love to others by leaving money for those in need. This was a picture taken a few years ago. Shoes are usually filled with gold chocolate coins, candy canes (to represent St. Nicholas' bishop's staff) and small gifts. My daughters also set up their doll's shoes too :) Growing up in a Catholic home, I never remember learning about Saint Nicholas. It's been so fun to learn about this giving Saint as we have raised our children. 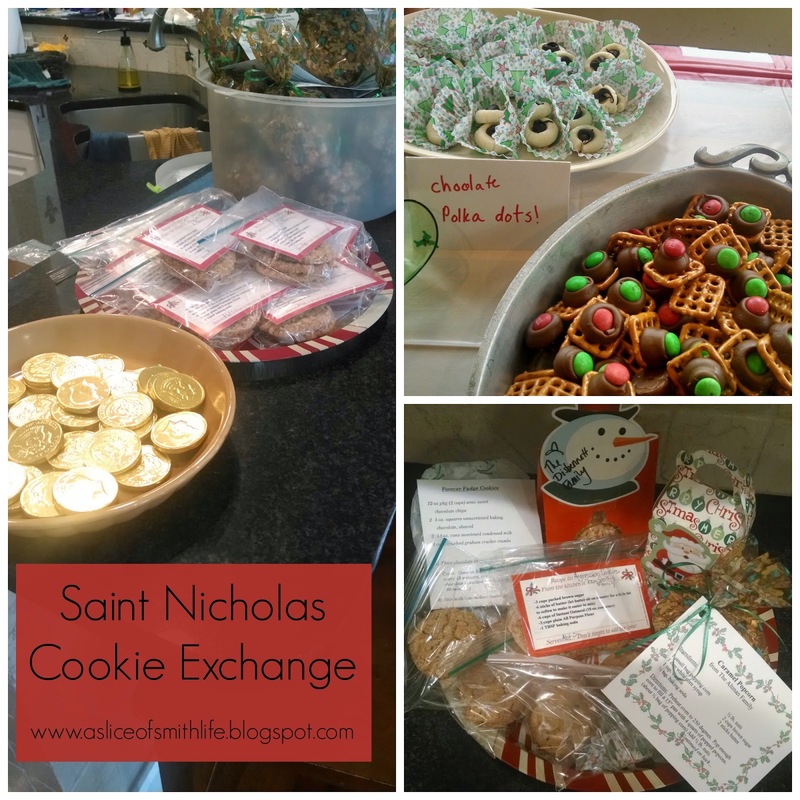 Have a cookie exchange party in honor of Saint Nicholas' fun and giving spirit. 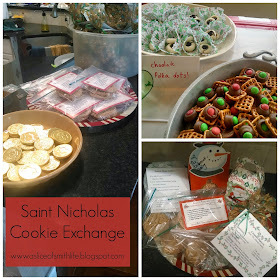 Today our homeschool group had a cookie exchange party as a way to celebrate Saint Nicholas' feast day. 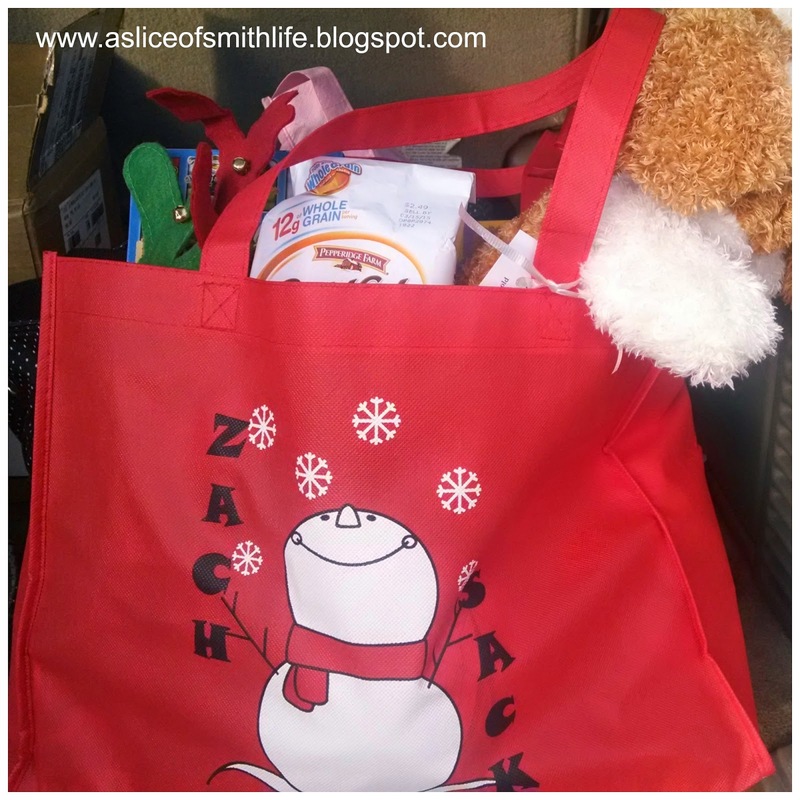 We had 9 families total come to my house and each family bagged up their cookies with their recipe and gave their goodies to each family. We also had a table filled with the cookies to eat at the party. (Everyone loved that!) In the top right corner picture are the pretzel treats (Recipe HERE) my daughters made and we also made "Aggression Cookies" to hand out to each family. Recipe coming soon! Give gifts to sick children in hospitals. During Christmas 2009 our son Zachary had bacterial meningitis and the miracle that occurred on that Christmas day. He was rushed to the hospital Christmas Eve and was in a fight for his life. The medical staff was doing all they could do but it was the definite touch of God’s hand on Christmas afternoon that turned him from death’s door. Everyone in and around the room during that moment saw it….to quote one of the nurses in the room at that time ,“that was a Christmas miracle.” We still are so appreciative of all your prayers for us during that time. That is the “long story short” version to give those who didn’t know a bit of background information. For anyone who has been touched and endured traumatic moments you know the nightmare that occurs within those hospital walls along with the struggles, challenges and weariness during those times and even years after. 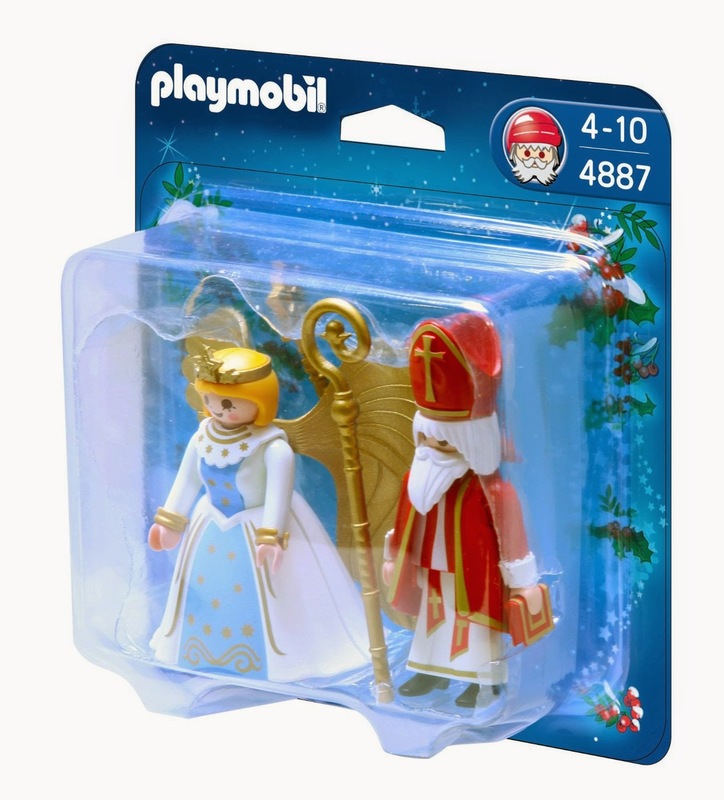 Give a Saint Nicholas toy. My children received this set a few years ago on Saint Nicholas' feast day and they enjoy pulling it out each year and playing with it. 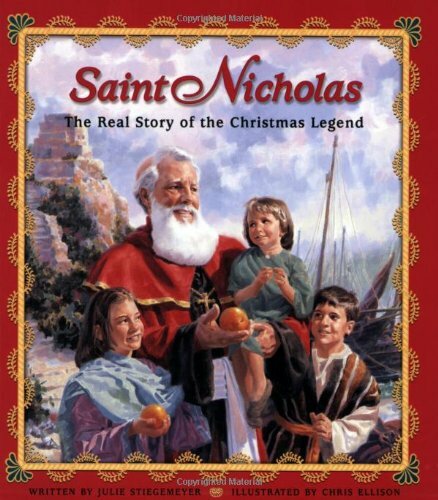 You can find more information about Saint Nicholas and how to celebrate his feast day in fun ways with kids at St. Nicholas Center: Discovering the Truth About Santa Claus. 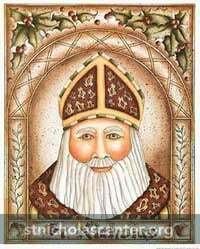 Have a blessed Saint Nicholas Day! 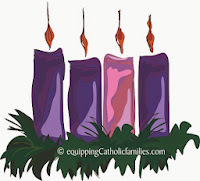 I'm linking this post to Catholic Bloggers Network's Advent Link Up: Week Two! Beautiful traditions, Tracy! Enjoy the big feast day tomorrow!! I love all of your suggestions- especially the hospital. What a great idea. And what a harrowing story. So glad for your miracle. Love these traditions! In my family the tradition was to leave out your shoes and you would receive two gifts - one to keep and to give away. My grandma likes St. Nicholas day so much she sent my a little St. Nicholas day story and gift in the mail all through college! (Freshman year she sent three copies of the story and 6 gifts so me and all my roommates could participate. These are cool ideas! 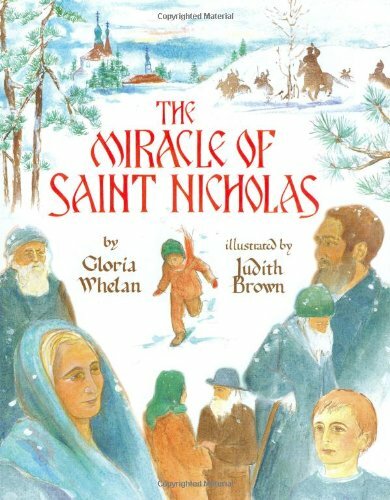 We finally did some St. Nicholas Day activities this year (filled the girls' stockings with Glory Stories from Holy Heroes) and it was a lot of fun - a nice way to kick off Advent the first week of Advent. The girls love St. Nicholas too so it was a good excuse to talk more about him and about GIVING at Christmas. :) Thanks for sharing! The family that collects donations for the sick children in the hospital is so glad to pay it forward like this as they remember so well the time their son was so sick! It really is an amazing miracle and our family is blessed to help as much as we can! That is a great tradition that I have never heard of before! Thanks for sharing! What a great tradition your Grandma gave you! We love Glory Stories too! So many great feast days during Advent, especially St. Nicholas!